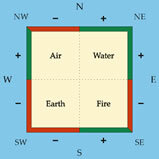 The four directions-north, south, east and west-are divided into sub-directions. These sub-directions are considered to be either positive or negative. Vaastu shows how to emphasize or diminish a sub-direction’s influence by indicating what should be placed in that area of your home or property. This diagram illustrates the positive and negative directions and the locations where the elements have their greatest influence on your property. This chart is used to determine the positions of streets, gates, driveways, entrances, property extensions, cuts, doors and windows. The green area indicates where to favorably locate these features; the red areas indicate where it is detrimental for them to be placed.